Asparagus recipes. Great food. Medical wonder food. Asparagus recipes are really varied. Dozens are available but here we will not only feature our favorites but we will take a look at the great things that this wonder vegetable will do for good health. Asparagus has been around for many centuries. The ancient Egyptians used it and the Chinese have enjoyed the benefits for more than five thousands years. They not only used it as a vegetable but it has been featured as a diuretic. The oldest known and surviving recipe book details one for cooking asparagus. Asparagus has very few calories to take away the worry of loading up on fat. It is very low on sodium and zilch cholesterol. It’s loaded with vitamin B6, magnesium, calcium, zinc. Plenty of fiber, protein and vitamin A, C, E, K, as well as riboflavin, thiamin, copper, potassium, rutin, niacin, phosphorus, iron and folic acid and selenium. Asparagus should be classed as a wonder drug for our good health. Only the young shoots are prepared to be eaten. They can be stir fried, grilled over charcoal or hardwood chips. It can be boiled or steamed as well as added to soups. It can be used in desserts and it can also be pickled and will last for years in this manner. A low calorie source of folate and potassium is reported by nutritionists and asparagus stalks are very high in antioxidants. In fact only six spears contain 135 micrograms of folate. This is almost half of the recommended daily intake, 545 micrograms of beta carotene as well as 20 milligrams of potassium. Researchers indicate that folate is very effectual in fighting homocysteine, one of the substances in heart disease. Folate is also important for pregnant mothers, protecting against neural tube defects in young babies. You may reduce the loss of calcium from your body by getting a good daily dose of potassium. Finally the asparagus recipes health benefits include a good dose of vitamin C which aids the body in the production of collagen the wonder protein that helps the cells and tissues. This is a very easy way to create an interesting side dish. Great as a holiday treat and is a wonderful way to dress up a chicken dinner. Preheat oven to 450 degrees F (230 degrees C). Spread the prosciutto slices with the cheese. Wrap the slices around 2 or 3 asparagus spears. Do this to them all. On a baking sheet spread the wrapped spears. 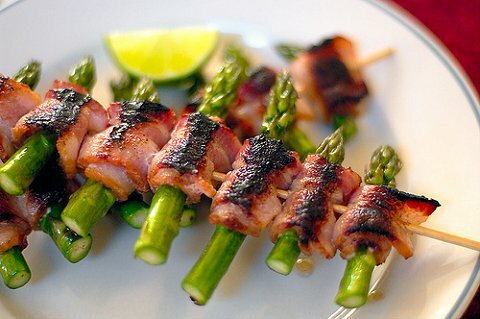 Pop them into the oven for fifteen minutes until the asparagus is softened. Serve to your happy guests and enjoy an asparagus recipes. DirectionsPreheat oven to 375FPlace the asparagus spears in a steamer with about one inch of water. Cook with the cover on for 5 minutes until it gets crisp. Drain the pot and place it in a baking dish. Place the cheese slices over the asparagus. Combine the melted butter, bread crumbs and sesame and sprinkle this over the cheese. Place it in the oven for 7 or 8 minutes and then broil until the breadcrumbs until golden brown. Hope you enjoy asparagus recipes. Don't you just love chicken recipes, especially chicken breast recipes. For a variety we do the chicken casserole recipes quite often. When I need to do something new I check the internet for hints on how to cook chicken. Once we found slow cooker chicken recipes on a site and they were fantastic. Oven fried chicken really seals in the taste so that when it comes out of the oven that perfect aroma spreads through the house, similar to what happens when we cook chicken cacciatore recipe.